There is a lot of fear right now. Fear of struggle. Fear of violence. Fear of depression. Fear of it getting worse. Fear of sadness. Fear of unanswered questions. Fear of pain. Fear of loss. Fear of it never getting better. Fear of the unknown. Fear is a constant topic in my office with my clients; most often the fear of the unknown or the fear of things never getting better. The exact sentiments we are seeing and feeling in our community lately. Fear keeps us stuck and paralyzed. Fear makes us react instead of respond. 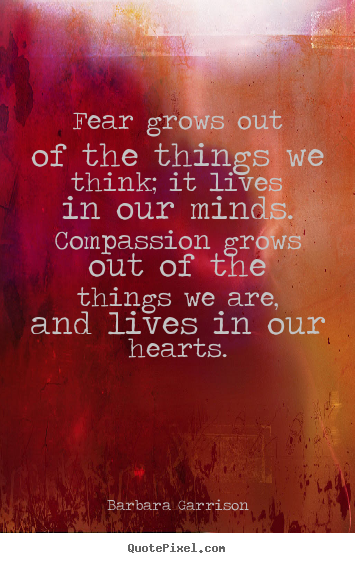 Fear keeps us from living our lives authentically and wholeheartedly. Our challenge is not to get rid of it or to not feel it or to stuff it down or to numb it out. I think many times we are socialized to believe that we shouldn't feel "negative" emotions; fear especially. But the fact is, just at Brené Brown states, we cannot selectively numb out the dark. Our challenge is to embrace it, move through it and live our lives with courage despite the fear. We must make the choice to not live our lives from a place of fear. When we live our lives from a place of fear we only hurt ourselves and others. Living our lives from a place of fear means we use shame and anger to get through our days. Living our lives from a place of fear means we compare and live from scarcity. Living our lives from place of fear means we ultimately choose to live in the dark all alone. Rather, we must make the choice to live our lives knowing that our fear will not kill us. Knowing that our fear doesn't have to mean we hurt ourselves and others. Knowing that we can embrace these "negative" emotions (jealousy, anger, sadness, shame, etc.) and trust that most are coming from this place of fear. But, knowing that we can move through the fear with bravery. "The dark does not destroy the light; it defines it. It's our fear of the dark that casts our joy into the shadows." "Fear borrows from a future possibility and makes it our present reality. Fear is believing that the best God has for me is the worst I can imagine. But, faith can bring us through it." "We need to find our courage, which of course, is not the absence of fear but rather the willingness to feel the fear and move forward anyway. Fear isn't going to kill us. It's an energy that we can allow to move through us." "Compassion. It's not just a word. It's a way of being. It's not just a concept. It's love in action. It's not just something we conveniently practice. It's something we consistently embody. Compassion for those who are struggling. Compassion for our shared humanness. Compassion for the courage it takes to make it through. Unity begins with compassion. I see me in you, I see you in me, and I want us to live from love together." What would it be like for us to simply name our fear? Name it, identify it, feel it and embrace it. Allow it to move through us by also allowing enough space for courage. Through practicing this bravery we will not have to keep living our lives from this place of fear. We can find the compassion for ourselves and others. We can find the light in ourselves and others. We can find our loving power in ourselves and others. And, maybe, we could heal. Ever Upward: Overcoming the Lifelong Losses of Infertility to Own a Childfree Life is now available for presale! This post linked at Amateur Nester's Link-Up!